What is A Rinnai Demand Duo SYSTEM? Rinnai Demand Duo is the combination of between 1 and 6 gas continuous flow water heaters with a storage tank. The storage tank allows a short period of high hot water flowrate, greater than the continuous flow rate of the Infinity water heater(s). and when it drops below the set point, the primary pump is activated. This flow in turn starts the Rinnai continuous flow Infinity water heater which returns heated water to the tank. What are some suitable applications? Installations of this type typically have a predictable hot water volume, usually based on number of people living in a particular building either showering, washing or eating, or industrial machines that require regular peaks of water. 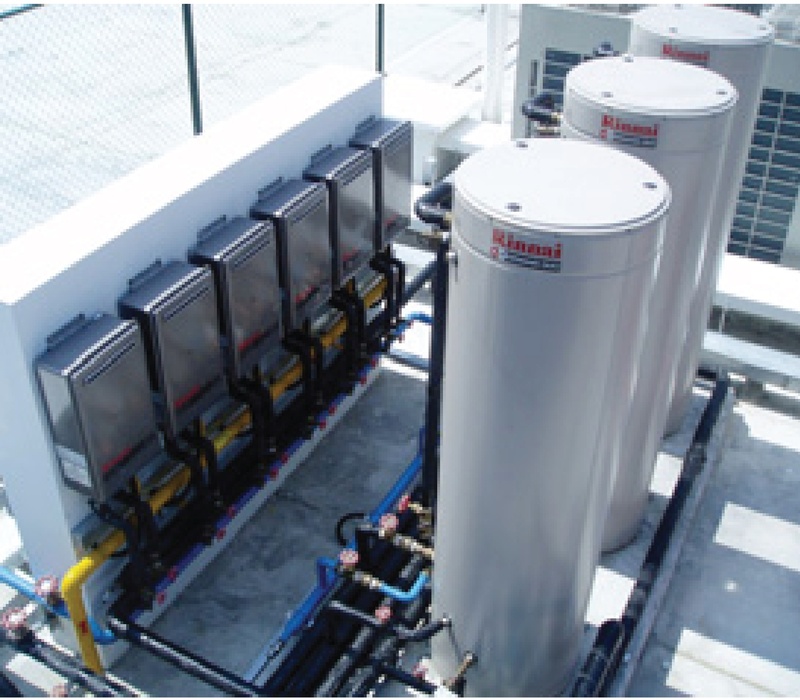 Demand Duo are often used on projects on a flow and return system to distribute the water around the building . 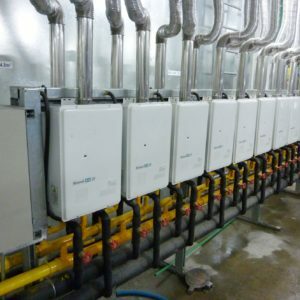 It should be noted that flow and return systems continually lose heat through the circulation pipe work and this adds running costs to the project. Refer to the table for selection examples on pg10. What are the benefits of rinnai Demand Duo? Demand Duo storage hot water systems hold 250 to 315 litres of hot water per system. This is available where high peak flow rates for short periods of time are common. 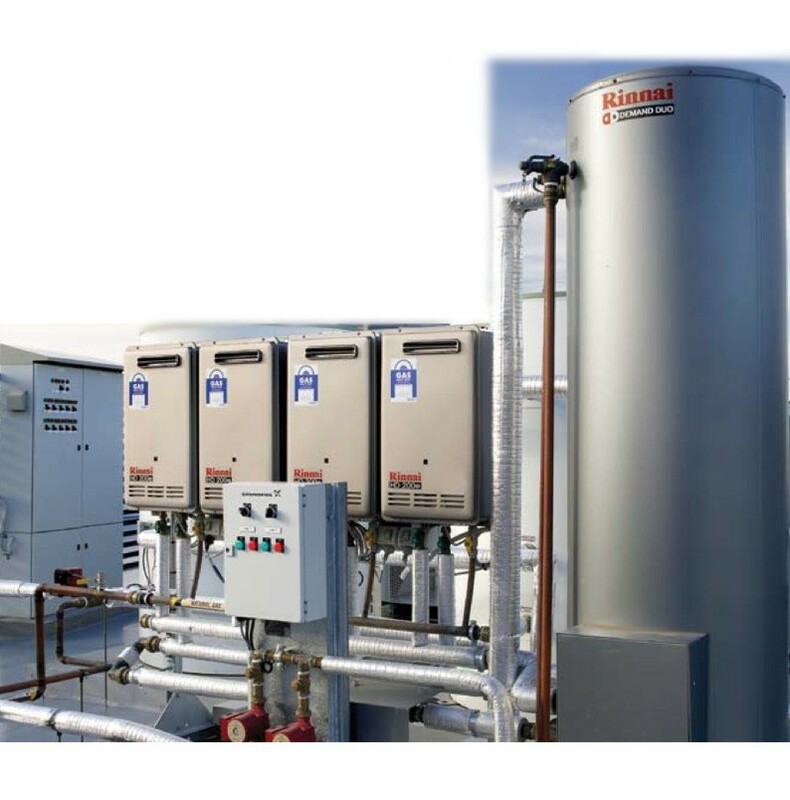 Recovery is matched by selecting the required number of Rinnai Infinity water heaters. 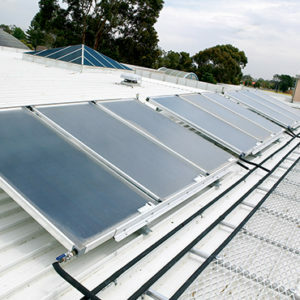 The heater(s) can also be mounted many metres (remotely) trom the tank. Note: Extended primary pipe runs must be oversized and/or a primary pump upgrade. Please contact your Rinani Commercial Representative for further information. 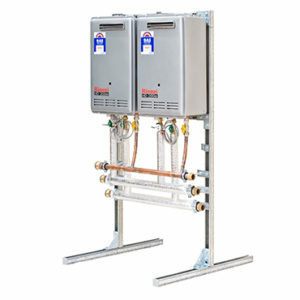 Rinnai Demand Duo systems can also be used instead of Manifold Packs for projects where limited gas is available.